Welcome to the world of Fine N-SCALE Products. On these pages you will find a complete listing of our products along with descriptions and color photos. Since 1992 we've been supplying N-Scale modelers with authentic, easy-to-use, finely detailed cast resin kits and accessories at reasonable prices. Our kits are....uhmmm...kits. That means that you get to assemble, paint, decal, and such to finish. They are all made with the first-time modeler in mind and really are easy to complete. You not only get a finely detailed model, but a real sense of accomplishment. Includes eight pieces each of three sizes of steel coils. They scale from about 4 to 6-feet in diameter and 3 to 4-feet in width. They’re perfect for steel mills of course, and are used as loads on flat cars, gondolas, and flatbed trucks. This is an assortment of eight different crates totaling 3-dozen pieces and includes scale lumber for skids where needed. Ideal for loading docks, factories, freight forwarding locations, and loads on freight cars and trucks. Lots of stuff is shipped in sacks from cement, fertilizer, and seed to plastic pellets and dog food. These stacks of stuff were modeled after pallets of cement and concrete found at our local lumberyard. 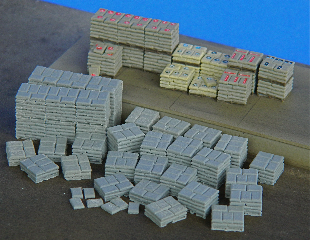 The kit includes twenty-six castings plus a few individual bags O’ stuff. Eco-Blocks, or whatever name they go by in your region, cast concrete blocks with a built-in cable lift ring. They’re used for traffic and erosion control primarily, but are seen at sand and gravel yards, building supply yards, in short, anywhere a temporary, portable, inexpensive containment wall is needed. They also form low, two to three blocks high, retaining walls. The kit includes a dozen full blocks, six half-blocks, and three each of assembled blocks on and two high. These loading docks were designed for use in intermodal yards, but are handy for warehouse docks and freight forwarding operations. Each kit includes two docks, approximately 20 by 60-feet, two ramps, plus some traffic cones and parking bumpers to keep forklifts and workers from going over the edge. The ramp is shaped to fit anywhere around the edge of the dock, and docks can be joined end-to-end or placed side-by-side. Copyright 2002-2016 Fine N-Scale Products.